Happy Wednesday, y’all! We love photographing engagement sessions! There is nothing like capturing the excitement and emotion that comes with each and every engagement. It’s the one and only time in a couple’s life where they get to call each other “fiancé,” and it’s a moment that deserves to be celebrated and remembered. One of the most common questions we get from our couples before their engagement session is: What do we wear? So, today, we’re sharing our five “do’s and don’ts” that can serve as a tool for anyone planning an upcoming engagement attire. 1. DON’T BE AFRAID TO DRESS IT UP. 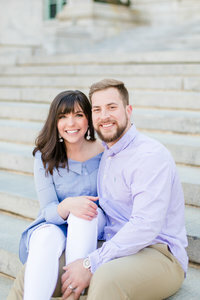 An engagement session is the perfect excuse to have some fun and really dress it up! Think cocktail dresses and high heels for the girls and ties and dress shoes for the guys. If you ask us, there is no such thing as being “too dressy” for your engagement photos! 2. DO ACCESSORIZE. The right accessories can add the perfect “pop” to your images. The camera LOVES big, bold statement necklaces on ladies and leather belts and watches on the fellas. 4. DO LAYER Never underestimate the power of a great blazer! Layering adds such great depth and dimension to your photos. Even though we live in Southern Maryland, where most of the summer, extra layers are H-O-T, it’s so worth sixty minutes of discomfort in exchange for fabulous-looking photos that will last a lifetime. As we always say, happy wife, happy life! 5. DON’T STRESS! Wear something that makes you feel confident and beautiful, and don’t ever stress about what you’re wearing. Stay true to yourself and make sure you feel comfortable. When you feel good, it shows! We truly believe confidence is the best accessory.